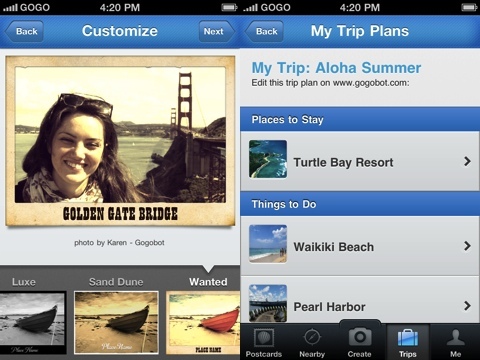 If Hipster, TripAdvisor, Pinterest, and Instagram had a love child, then it would be Gogobot’s iPhone app. You create and share postcards of your travel with this app blending social media and photography. If you are familiar with the Gogobot online presence, then you’ll find this iPhone app to be missing a lot of functionality. You must keep your location services activated to use the Gogobot app while you travel. A list of nearby restaurants, parks, and notable spots is at your finger tips. You select your location and snap a photo. Then, you get to chose from the cool, interesting photo effects and postcard graphic. The photo effect is combined with a specific postcard layout and design. The photo effects range from sepia and black and white treatments to changes in light and perspective. The effects are similar to Instagram and Hipstamatic, and you can scroll through the options to make a choice about your postcard. You’ll appreciate the quick response and agility of the photo effect and postcard layout interface. Once you select and save your postcard, you can share to Facebook and the Gogobot community. You can also choose to rate the site you visited. This is optional, but the intention is to keep your friends and followers in the loop in their travels. I wish you could apply treatments to existing photography, but that is not currently a possibility. The digital postcards saved from Gogobot users create a beautiful news feed. You can like a favorite postcard and check out reviews. The interface and experience is similar to Pinterest’s feed, but with less opportunity to connect, comment, and share. Although the functionality is less intense than Pinterest and TripAdvisor, the Gogobot iPhone app hits the big items–is it great and what does it look like? If you have built itineraries online at Gogobot.com, then your travel itineraries will be available on your iPhone through the app. You cannot currently build itineraries on your iPhone. Since I was not familiar with Gogobot online, I was extremely underwhelmed by this iPhone app. When I checked out Gogobot online, I thought it was really cool and interesting. You can ask for travel recommendations for a specific location, check out detailed hotel information, look through amazing photos, and read awesome reviews. The people who use Gogobot are fierce travelers. After I checked out Gogobot’s online community, I played around with the iPhone app again. The Gogobot iPhone app just doesn’t live up to its online capabilities. Unfortunately, the developers streamlined all of the cool out of Gogobot. There is amazing potential in Gogobot.com, and hopefully, eventually, the Gogobot iPhone app will be updated to reflect the terrific online content. AppSafari review of Gogobot – Travel Postcards,Things to Do, Restaurants was written by Jenni Ward on January 24th, 2012 and categorized under App Store, Free, Local, Social, Travel. Page viewed 4576 times, 1 so far today. Need help on using these apps? Please read the Help Page.